There is such wonderful chamber music, in which the Viola plays a primary role. 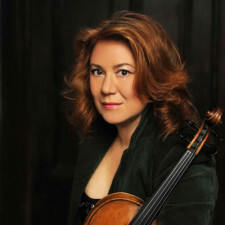 To give these works for the Viola and its partners a podium, Tatjana Masurenko established the concert Series, “Viola Plus” in the Leipzig College of Music and Theatre in 2003. Together with renowned musicians, the series unites both teaching staff as well as students from different faculties (strings, wind, piano, voice) to perform chamber music of many styles and facets. Guests of the concert series have included the likes of Brigitte Fassbaender, the Vogler Quartet, Philipp Moll, Christian Giger, Carola Gruber, Nick Deutsch, Roglit Ishay, Michelle Breedt, Özgur Aydin and the Leipzig Viola Ensemble. Within the framework of Viola Plus Tatjana Masurenko has brought much scarcely played music to the stage as well giving many Leipzig premieres, amongst them the Viola-Quintet by Edwin York Bowen; the Viola-Quartett by Benjamin Dale; Trios for Viola, Oboe and Piano by A. Klughardt and R. Kahn; Songs for Mezzosoprano, Viola and Piano by C. M. Loeffler and Frank Bridge; “Des Todes Tod” by Paul Hindemith and important contemporary pieces for Viola and chamber orchestera (Kantscheli, Denisow, Korchmar). Many composers have written works specifically for the concert series including Nejat Basegmezler, Johannes Dittmar, Andrès Maupoint, Aristides Strongylis, Dmitri Terzakis and Spiros Mouchagier. Both the solo sonata and the sonata for viola and piano by Ernst Krenek were given their Leipzig premiere by Tatjana Masurenko at Viola Plus. For upcoming Viola Plus concerts, check the dates given here.